This is a Limited Edition CD on Ace records of only 1500 copies. 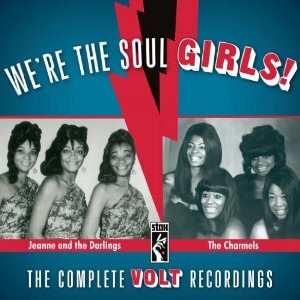 This CD brings together all the Volt recordings of two girl groups, Jeanne and the Darlings & The Charmels into this nice neat package. Most may know Jeanne and the Darlings, Soul Girl & How Can You Mistreat The One You Love. But may be unfamiliar when other great track such as It's Unbelievable (How You Control My Soul). The Charmels with As Long As I've Got You & many other deeper sides, I've Done It Again. The whole CD is filled with guitarist Steve Cropper's soul fills, along with some originally unissued tracks and seven sides that are previously new to CD. Compilation and notes by Tony Rounce. Recommended Memphis Southern Soul. Issued on ACE CDLUX 009.